It’s a Joke, Son! 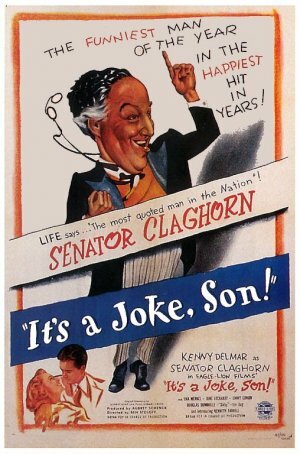 is a 1947 American film directed by Benjamin Stoloff featuring radio comedian Kenny Delmar as Senator Beauregard Claghorn; the inspiration for the cartoon character Foghorn Leghorn. The film was the first American production of Eagle-Lion Films and although the film was produced on a very small budget compared to other Hollywood films at the time, it was a box-office disappointment, with one theater chain removing the film from theaters after less than a week after it only drew $1,000 in ticket sales. When the Daughters of Dixie nominate Magnolia Claghorn as a candidate for State Senator, the local political machine run by Northerners fears its candidate will be defeated. Through the Claghorns’ daughter’s boyfriend Jeff, the machine gets the idea to run Magnolia’s husband Beauregard as a candidate in order to split the anti-machine vote. They don’t count on Beauregard’s incredible popularity and seek to stop him.